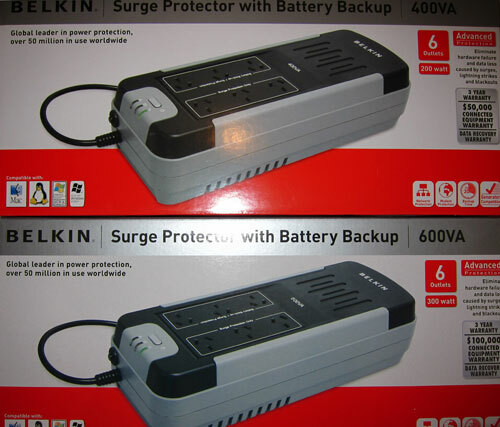 Thanks to 2 Belkin UPS (Uninterruptible power supply) units none of my key electrical equipment got damaged last week when the electrical wiring in part of my home failed. If you don’t use a UPS then you’re taking the risk that a lightning strike, power surge, electricity brownout or blackout will cause your Computer, modem, TiVo/Foxtel IQ etc to get damaged. I initially got a Belkin F6S600au 600VA UPS for use in my office to protect my computer, monitor and the gadgets I recharge there including a laptop, mobile phone, video and digital cameras etc. Note that electronic devices which draw a lot of power like laser printers and heaters should always be plugged in a surge protector socket of a UPS, never in a battery backup socket. The F6S600auUSB 600VA has 6 power sockets which supply upto 300 Watts of power. All 6 power sockets have surge protection and 3 have battery backup as well to keep your equipment running long enough to safely shut it down in the event of a electricity brownout or blackout. Both the F6S600auUSB and F6S400auUSB have a built-in pass through phone line socket to protect your landline phone or ADSL modem. This worked fine with a traditional ADSL phoneline which had a PSTN dialtone and a naked ADSL line without dialtone. During times of peak power use such as a hot day in summer, Sydney (like the other big cities in Australia), suffers from brownouts (short power outages) due to the crumbling electricity infrastructure and inefficiently designed houses and buildings which use air conditioning a lot to maintain a comfortable inside temperature. Brownouts can be particularly damaging to electronic equipment because it is common for brownouts to occur several times at close time intervals with power going up and down. This causes devices like Computers, NAS or PVR’s such as the TiVo and Foxtel IQ to crash due to lack of power, restart and then crash again potentially losing data in the process. Many people run a small business from home but probably don’t realise that a home and contents insurance policy only covers lightning/power surge etc damage to your personal electrical equipment. Any electrical device you’ve bought for your business or which is used primarily for business purposes isn’t covered for damage from a lightning strike, power surge, electricity brownout or blackout so it makes sense to self-insure by supplying these with power through a UPS. And include a Data Recovery Warranty so if your Belkin UPS product fails while properly connected and your hard drive is damaged, Belkin will engage Seagate Recovery Services to recover the lost data. If you want to buy a Belkin UPS, shop around on the internet because prices vary a lot eg: F6S600auUSB ($110-170), F6S400auUSB ($90-$130). There is a huge demand for UPS in the third world countries that still have poor management of its electricity boards. I’ve been using UPS for over a decade, mostly because my old location had unreliable power and having the computer reset when the power flickers is extremely annoying…but it’s nice to be able to keep working during a storm without worrying about it! Just been looking at the Belkin as a possible replacement for my dead UPS. As a recording musician having a unit such as this allows me save my recordings without an unexpected shut down. I just bought the Belkin 600va UPS with 3 battery outlets and 3 surge-protection outlets. Model after much searching of net (not on box etc.) is F6S600auUSB. I have a laptop with battery which gives about 3 hours power without mains. I bought the UPS for my modem which is an ADSL with mains power. 1. When power is off, alarm sounds every 3-4 seconds. Every 30 seconds would be more than adequate. As it5 is if power is off for any length of time, it is an extreme annoyance. 2. When power has been off for 30 minutes the UPS shuts down. The modem is 12v 1amp, so UPS should handle it for many, many hours. 3. Software seems a little disfunctional.